What would you pay if “peace of mind” was sold in a bottle? Many people would spend everything they own for it. But what if you didn’t have to? What if you could find “peace of mind” for free? “Peace of mind” is not to be found in a bottle, but it is to be found in the Bible! 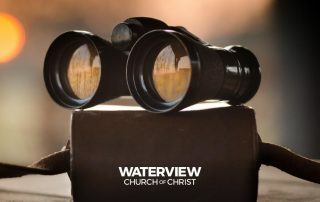 In the book of Philippians, the apostle Paul take us on a journey to discover the things that everyone is searching for that will allow them to enjoy the blessings of this book. The theme of Philippians is "joy." That being the case, we shouldn't be surprised that Paul's last words of this book (Phil. 4:14-19) are about joy too. But the last, great lesson on joy in Philippians is a lesson about "the joy of giving." We normally don't associate "giving" with "joy" but Paul did. In this lesson we notice some tangible ways to better appreciate how there really is joy in giving as Paul uses the gift of the Philippians as a lesson for us today. One of the most memorable verses in the Bible is often not clearly understood. Phil. 4:13 is not the motivation to win the game or run a race. It can be, but it's much, much more. It's really about persevering through trials and struggles to be able to do what God has asked you to do. And when you fail at that, it is the calm reassurance Jesus will cover for you. Christianity is a religion that is both private and public. The public side of Christianity is the nature of Paul's words in Phil. 4:5-12. The emphasis seems to center on how our handling of people and situations have a tremendous impact on those who will witness our faith during times of difficulties and trials. This lesson is a reminder that you really can make a difference in our world! In Philippians 4:4 Paul gives a command, not a suggestion. The key word in this verse is "always." In this lesson, we discuss how to do that even during times when we don't feel like. Unfortunately, peace is rare. Whether it be the nations, our country or even our churches, there is typically division and disputes. In Philippians 4:1-3, Paul steps in to try to resolve a conflict with two women. But, in doing so, he shows us a lasting process to follow to help bring about peace if we desire to be a peacemaker. The saddest person in the world is a discouraged Christian. Yet, discouragement happens to all. In Phil. 3:12-21, Paul gives a series of instructions to help Christians overcome discouragement and fulfill God's plan for them to keep moving forward! The message of Philippians is the Christian life is "joyful" and, therefore, we should "rejoice." The Christian life is the best of all lives to live, but sometimes there are things that "rob" us of the joy of Christianity. In Phil. 3:1-11, Paul warns us about those things. What's the secret to life? We believe the secret to life is the Christian life! But what's the secret to the Christian life? In this lesson we look into the life of a young preacher named Timothy who shows us the real secret to the Christian life: It's not about you! Have you ever wondered what "Work out your own salvation with fear and trembling" really means? In this lesson we explain what it doesn't mean and what it does mean. And we also explain how that fits into the overall theme of "joy" in the book of Philippians. How to have the same mindset and attitude as Jesus.